People ask The Legal Genealogist all the time how to get started writing family history. And the best I can ever say is, tell the story. Just put words on paper to begin with, telling the story the way you would tell it sitting around with friends, or around a campfire, wanting those who hear it to get caught up in the events and the tale itself. You can go back and polish the words later. You can — you must! — add the citations to the sources you’ve relied on. To paraphrase Dr. Thomas Jones, editor of the National Genealogical Society Journal, you have to write not only to tell the story but so that everyone who reads it knows that it’s the right story, relying on the facts as best they can be found. But always… always… always… tell the story. Getting started is never easy. We all sit there staring at a blank piece of paper thinking we can never fill it up, or at least never do it right. And each and every one of us, at one time or another, will need some special bit of motivation to get started, to tell the stories we all have to tell about our families. And along comes the Dallas Genealogical Society with five hundred reasons to get started writing our family’s story. Well, that’s for first place. There are three hundred reasons for second place. And one hundred and fifty reasons for third place. Yup. A family history writing contest with hard cold cash as prizes. Folks, it doesn’t get a whole lot better than that. No, you don’t have to be a member of the Dallas Genealogical Society. And no, you don’t have to write about Dallas families, or even Texas families. You can be someone who does genealogy just because it’s fun, you can be a professional, you can be somewhere in between. You can write a family history, or a compiled genealogy, or a case study, anything that tells a family’s story and does it in a way that demonstrates good, solid use of genealogical methodology, techniques, and sources. The rules are pretty simple. Whatever you write can’t have been published anywhere else. You have to write it and send it in by 30 September 2012. You’ll be judged on accuracy (no fiction, okay? ), style (go ahead — write with flair) and clarity (we do need to understand it). Winners will be announced at the Dallas Genealogical Society’s Annual Awards Luncheon in December — first place is $500; second place is $300; and third place is $150. And no, you don’t have to be there to win. 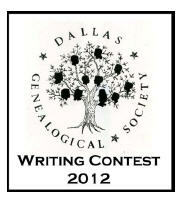 You can get more information about the contest at the Dallas Genealogical Society website. So… what are you waiting for? There are 500 reasons to get started! Thank you Judy, for giving the contest a big send-off. A correction. For now, more information can be found by emailing me at [email protected]. We are having temporary problems with the link from the website to the information. I hope we see many entries that demonstrate good research and writing. Hmmmmm… this sounds very interesting! Would definitely get me off my duff to write about some thread of my ancestors, other than what I’ve done to date for my dad’s very short lines. Thank you Judy! There you go — real motivation! Hi – the link on the website was fixed on June 10. The email address to use if you have any questions about the contest is [email protected]. Marianne Szabo, Director of Publication Content for Dallas Genealogical Society. Thanks for letting us know — hope you get lots of good entries!